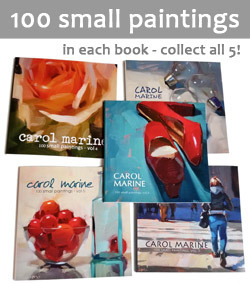 Carol Marine's Painting a Day: Surprise! 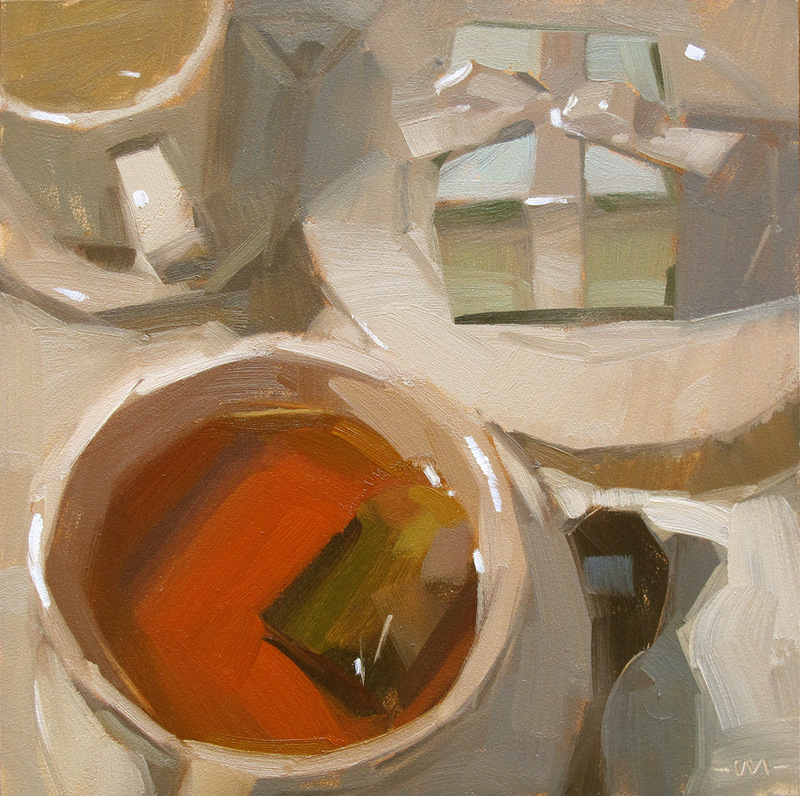 Imagine receiving this little box during tea with a good friend. Ok, imagine having tea first. Having, like, high tea is something I've always wanted to do. With little crumpets? Not that I know what a crumpet is. And since I don't eat wheat I probably can't have crumpets. And don't crumpets sound like something muppets should have? Wait ... I think I got off topic. Wouldn't this make a great wedding present?? (or engagement!) The limited palette, the white on white. SO inviting! And if you ever decide to have a little bit of wheat... crumpets with butter and jam are EXACTLY what you should have! Great job on the teabag, too, my favorite part. What does that say about me? Shouldn't it be the present????? J'aime la délicatesse de sa composition et du choix des couleurs très joliment nuancées. Is that a Tiffany's box? You know what they say about small packages... Love everything! What a delightful arrangements of components. And I, like Kelly find the reabag fascinating. I have had high tea once on a cruise ship, and it was an experience to remember. Really love this painting, Carol! The limted palette with those beautiful colours - perfect! A beautiful painting. Love all of the elements of this and those whites. Love your sense of humor too :) A pleasure to stop by. Mmmm, the color nuances are just YUM! Another great painting! I really love your technique! Fantastic painting!I love the subtleties in all the tints of white. And the tea and tea bags are simply fantastic. Lovely rich colour. A real master's painting! I would buy it if I had the money! I LOVE this. The arrangement of shapes, and the PERFECT tea color, the darks of the teabag and spoon, then the delicate minty top of the box. The whole thing is genius. Just fantastic painting of Whites. You are the master. Love it! These paintings NEVER get old!! if you ever come to the UK,it would be a pleasure to offer you a real afternoon tea; little sandwiches, fresh scones with clotted cream and jam, and crumpets, which are wonderful toasted, hot and dripping with melting butter. Yes wheat, Yes Carbs, Yes calorie-damage, but once in a while, just perfect! Let me know when you're on your way, and I'll put the kettle on!! whoa, you totally GOT the color you see when you look down into a cup of tea. great!